In this issue of the JCI, Bijanki et al. report on the mood-enhancing effects of cingulum stimulation during awake neurosurgery. 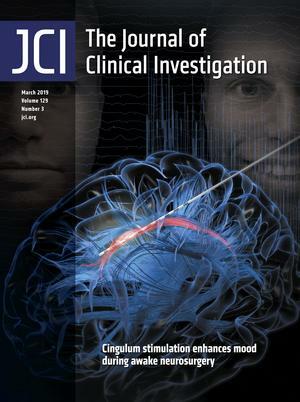 Three patients undergoing diagnostic intracranial seizure monitoring exhibited decreased anxiety and elevated mood following low-intensity stimulation of the anterior cingulum bundle, a brain area involved in emotional and cognitive function. In one patient, this stimulation was used clinically to control intraoperative anxiety during awake craniotomy. This issue’s cover depicts the implanted electrode’s position along the cingulum bundle, which is highlighted in pink. In the background, a man’s changing facial expressions represent one objective measurement of the stimulation’s effects. Image credit: Bona Kim, MA, CMI, Emory University Brain Health Center. Citation Information: J Clin Invest. 2019;129(3):915-925. https://doi.org/10.1172/JCI125228. Citation Information: J Clin Invest. 2019;129(3):941-943. https://doi.org/10.1172/JCI126456. Citation Information: J Clin Invest. 2019;129(3):944-945. https://doi.org/10.1172/JCI126120. Citation Information: J Clin Invest. 2019;129(3):946-948. https://doi.org/10.1172/JCI126119. Citation Information: J Clin Invest. 2019;129(3):949-951. https://doi.org/10.1172/JCI126295. Citation Information: J Clin Invest. 2019;129(3):952-954. https://doi.org/10.1172/JCI126683. Citation Information: J Clin Invest. 2019;129(3):955-957. https://doi.org/10.1172/JCI127100. Citation Information: J Clin Invest. 2019;129(3):958-961. https://doi.org/10.1172/JCI127101. Citation Information: J Clin Invest. 2019;129(3):962-964. https://doi.org/10.1172/JCI127580. Citation Information: J Clin Invest. 2019;129(3):965-968. https://doi.org/10.1172/JCI125893. Citation Information: J Clin Invest. 2019;129(3):969-971. https://doi.org/10.1172/JCI127578. Citation Information: J Clin Invest. 2019;129(3):972-987. https://doi.org/10.1172/JCI122779. Citation Information: J Clin Invest. 2019;129(3):1109-1114. https://doi.org/10.1172/JCI123791. Citation Information: J Clin Invest. 2019;129(3):1295-1313. https://doi.org/10.1172/JCI124030.